Nothing relaxes the body and mind like the soothing aromas of lavender. Combine that with a refreshing hint of black cherry and ginger from the Merlot skins and you are ready to lather your cares away. 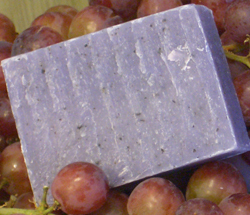 Hand crafted from the finest natural ingredients: Wine Grape Skins, Lavender, Palm Oil, Coconut Oil, Olive Oil, Water, Sodium Hydroxide, Fragrance and Essential Oils. Available in two sizes: 2 ounce bar (approximately the same size as the photo), perfect for the guest bathroom or bringing with you on any trip for a soothing pick-me-up at all times; 4 ounce bar, twice the size for twice the use, because once you start, you'll be hooked. Shipping is only $1.50 per bar, but we are offering a special of free standard shipping on 5 or more bars. Mix and match any size or fragrance for the free shipping. When using natural skincare products, always be careful to note all ingredients and avoid any that you are allergic to.